Currently, you share an apartment with three roommates, two fixed-gear bicycles, a cat, and probably a small army of bed bugs living happily between the threads of your Craigslist couch. What's the solution? Purchase your own village. 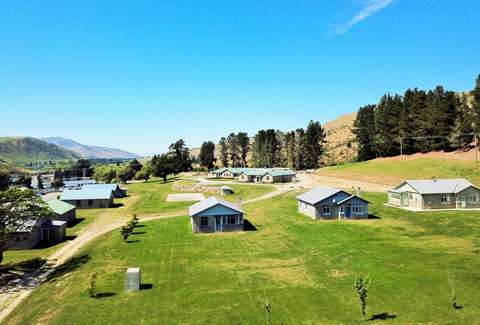 The apartment search will never be particularly rewarding, so you might want to consider taking up residence, instead, in Lake Waitaki village, located on New Zealand’s South Island. The township has been mostly empty for a full three decades, and now, the whole dang village is up for sale. And it'll only set you back $1.8 Million. 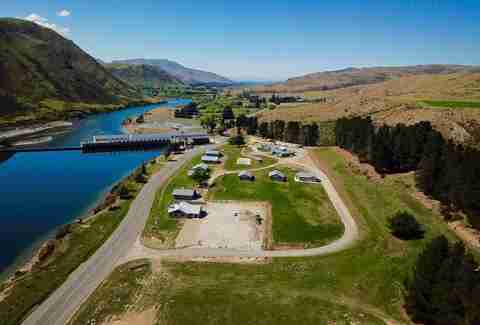 Once home to some 3,000 laborers hard at work building the Waitaki dam, the place was abandoned in 1989, when the dam became automated. Still, the stretch of land continues to offer nine garages, eight three-bedroom houses, one bar, a 6,300 square-foot lodge, and scenic mountain views, according to the listing. It will not include roommates, hallmates, a bartender, or neighbors of any kind at all. The scenic, lakefront property is miles from the nearest town. Like plenty of other countries, New Zealand is struggling with issues of urban flight. Lake Waitaki is among the rural communities tossed on the backburner as the country grows more urbanized. Each year, the government sets aside a billion dollars for regional development, which is intended as financial backing for revitalization projects in struggling rural areas, The Guardian reports. They're advertising more space! More jobs! Peace and quiet! Why trade all that in for a big stinky city? If you're interested in rescuing Waitaki, there is one small caveat, however. The New Zealand government recently banned foreigners from purchasing homes in the country, being that housing prices were starting to get out of hand. But fortunately, there's a convenient work-around: Non-New Zealanders can still purchase land through the overseas investment office. Or they can spend 183 consecutive days in the country, and earn themselves resident-status. That's not such a tall ask if you're going in on a whole village. So, if you're sick of living in a walk-in closet, this could be just the housing opportunity you're looking for -- with space for you and your 2,999 closest friends. Eliza Dumais is a news writer at Thrillist who does not have bed bugs. Follow her on Twitter for proof.